Give the gift of the Magnificent American West | RANGEfire! In the latest hardcover book from the nonprofit Range Conservation Foundation, the frontier history of the merican West is told through the words of two of the country’s most endearing figures, newspaperman and author Mark Twain and Theodore Roosevelt, the “rough rider” cowboy president. 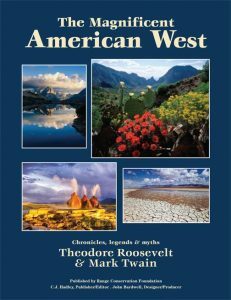 “The Magnificent American West” is published by the Foundation and offered through RANGE magazine. The hefty 148-page edition retails for $50, and is available at a special discounted rate of $39, which includes free shipping in the U.S.A. Nevada residents must add 7 percent tax. Sprinkled throughout their observations about frontier life are 142 images featuring works by some of the best ranch and wildlife photographers in the country. Photographers include David Muench, Larry Angier, Cynthia Baldauf, Larry Turner and Kathy McCraine. Western painters, Frederic Remington, C.M. Russell and J.N. Swanson are also featured. Priceless historical photos round out their story. “Publication of this book was made possible by generous donations from people who care about the American West to the Range Conservation Foundation,” says C.J. Hadley, RANGE magazine publisher/editor. The Foundation is an educational nonprofit 501(c)(3) based in Carson City, Nev.